Click on a thumbnail graphic for a gallery of drought data. Significant precipitation shifted into the Northwest, ending California’s period of favorably wet weather. During the 7-day monitoring period, precipitation totaled 4 inches or more in parts of the Pacific Northwest and ranged from 2 to 4 inches across portions of the northern Rockies. Lingering showers dotted northern and central California, but mostly dry weather prevailed in southern California and the Desert Southwest. Farther east, several disturbances crossing the Plains provided snow in advance of the strongest push of cold air in nearly a month. Snow was also reported as far south as Oklahoma and northern Texas, while generally light freezes were noted in California’s Central Valley. In late December, unusual warmth across the eastern half of the U.S. was replaced by cooler weather. Prior to the push of colder air, near- or above-normal temperatures had dominated the country for 3 weeks. Elsewhere, heavy rain soaked the Southeastern and Atlantic Coast States. The rain largely eased concerns about short-term dryness and drought development, but also caused local flooding. Rainfall was especially heavy, totaling 4 inches or more, from the central Gulf Coast into parts of the Carolinas. On December 23-24, a late-year tornado outbreak accompanied the heavy rain. With the storm track shifting farther north, significant precipitation overspread the Northwest. December 25 became the snowiest Christmas Day on record in Wyoming locations such as Lander (9.6 inches) and Cheyenne (6.8 inches). 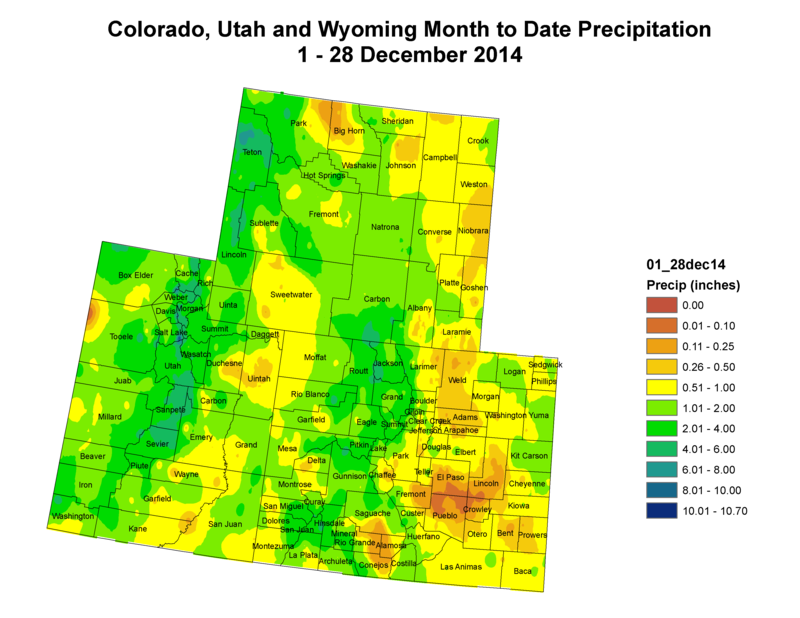 With precipitation spilling across the High Plains, December 25-26 snowfall totals included 10.6 inches in Scottsbluff, Nebraska; 7.7 inches in Cheyenne, Wyoming; and 5.1 inches in Denver, Colorado. Across the western slopes of the northern Rockies, precipitation was heavy enough to result in some very slight trimming of dryness and drought. Closer to the Pacific Coast, and especially in the Cascades, an interesting winter continued to unfold. Since October 1, season-to-date precipitation in the Cascades has generally averaged 105 to 125 percent of normal. However, with an unusual amount of the precipitation falling as rain, the late-December snowpack contained only about one-third to one-half of its typical amount of water for this time of year—except closer to 75 percent of normal in the northern Cascades of Washington State. This discrepancy—overall wet conditions but meager snowpack—has led to some mixed drought indicators, such as favorable rangeland, pasture, and winter grain growth and improved soil moisture, while concerns persist with respect to the possibility of limited runoff into streams and reservoirs during the upcoming spring snow-melt season. For the upcoming 5-day period (December 31, 2014 – January 4, 2015), a developing storm will produce an expanding area of precipitation across the southern U.S. On New Year’s Eve, snow will engulf the mountains of the Southwest. Some of the heaviest snow will fall in northern Arizona, although snow levels dropping below 2,000 feet could result in accumulations in some desert locations. Meanwhile, freezing rain may cause holiday travel disruptions in parts of western and central Texas. Later, the storm will shift eastward, bringing a return of heavy rain (1 to 3 inches) to the South and East. Some sleet and freezing rain may occur along the northern edge of the precipitation shield. Cold air will remain entrenched nearly nationwide, particularly across the western and central U.S., with freeze-protection measures required for sensitive crops, such as citrus, in parts of California. The NWS 6- to 10-day outlook for January 5 – 9, 2015, calls for the likelihood of above-normal precipitation in southern Texas and from the Pacific Northwest to the Great Lakes region. Meanwhile, drier-than-normal conditions can be expected in much of the Southeast and from central and southern California eastward to the southern Plains. Cold conditions will persist from the Midwest into the Northeast, but warmer-than-normal weather will continue across southern Florida and return across much of the West. The Middle Colorado Watershed Council (MCWC) is working with a variety of stakeholders on plans to improve the quality of waters in the Rifle Creek watershed, including east, middle, and west Rifle Creek and Government Creek. Studies indicate that the voluntary installation of best management practices could provide a net environmental benefit for water users, downstream fisheries, and wildlife. If funded, the monies will be used in a cost-share arrangement with participating entities. Flooded corn crop September 2013. It’s been more than 15 months since Boulder County was wracked by historic rainfall that caused area creeks to jump their banks, and, in some cases, create new channels entirely, resulting in extensive damage to homes and infrastructure along the way. Following an exhaustive public process, Boulder County officials announced earlier this month that they have finalized post-flood master plans for three local creeks: Fourmile, Left Hand and the St. Vrain. The plans are meant to be comprehensive guides outlining how best to restore and stabilize the watersheds for each body of water, including recommendations for bank stabilization, debris removal, re-vegetation and even channel realignment on public and private properties. While many of the individual projects contained in the plans are not funded, charting them out is expected to give stakeholders, especially municipalities, a leg up in securing the money needed. “If we identify the improvements in the plans it makes it much more likely they will be funded by grants coming from the state and federal government,” Boulder County Transportation Director George Gerstle said. Gerstle’s was among many county departments, including Land Use, Open Space, and Health and Environment, that contributed to drafting the master plans, but he credited the property owners and other groups concerned with the county’s environment with spurring the process forward. The county also employed the services of engineering consulting firm Michael Baker for the process. Naturally, there are many property owners who want to get to work on when the county’s various creeks and streams pass through their land, and Gerstle said the master plans are an important tool to make sure all work that is done has the entire watershed in mind. A creek of particular importance is the St. Vrain. Gerstle pointed out that the stream completely changed its traditional alignment just west of Longmont, leading to heavy damage in the city. The master plan outlines steps to put it back in its channel and keep it there in a way the respects the natural environment. Dale Rademacher, Longmont’s general manager of public works and natural resources, said he appreciated the opportunity for collaboration presented by the master planning process and the way it looked at the St. Vrain as a whole from it origins near the Great Divide down to it confluence with Boulder Creek. “We’re pretty happy with the outcome. This is a foundational document necessary to go forward for state and federal funding and we think it serves that purpose pretty well,” he said. Rademacher highlighted one project in the St. Vrain plan that he said could be underway next month. It involves creation of an overflow channel for Heron Lake that would direct flood waters away from Airport Road, an important street that still has flood barriers sitting alongside it just in case. Rademacher said the Heron Lake project is intended to “intercept flood flows that may come through the area again,” and protect property nearby. He said the project, which is the subject to an intergovernmental agreement between city and county officials, is expected to cost around $700,000 and is being put out to bid within the next week with construction hopefully beginning in January. Cherry Creek’s winter average rose closer to that threshold, measuring 174 mg/l between 2006 and 2010, which is up from a wintertime average of 122 mg/l during the 1990 to 1994 seasons – a jump of 43 percent. The USGS says as more areas become urbanized, the use of rock salt on roads and sidewalks increases, making its way into streams. More importantly, the data shows the problem compounding year over year because stream systems are not able to flush out all of the salt during the warm months. The effect is a higher baseline of salt content each year, allowing the levels to inch upward each cold season in urban areas. 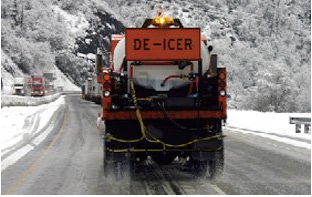 Salt compounds like magnesium chloride and rock salt are highly effective at decreasing the hazards of icy surfaces. There are few true alternatives to road salt, and other treatments can come with their own pollution problems. For instance, applying sand to roadways can cause air pollution when cars grind the material into dust. The USGS study found similar increases over the time period in other areas of the country, with the most severe chloride pollution levels measured in midwestern cities like Milwaukee, Chicago, Detroit, and Cleveland. The average summertime chloride level in Cherry Creek rose from 62 to 101 mg/l during the time periods in the study. By contrast, the study found streams in less-developed areas of Wisconsin and Oregon were able to maintain average chloride levels measurable in single digits. Researchers in Wyoming accepted the challenge of finding such verifiable results. They conducted a $14 million randomized blind statistical experiment that was designed and evaluated by the National Center for Atmospheric Research (NCAR). The primary laboratory consisted of two parallel mountain ranges, the Sierra Madre and Medicine Bow. During six winters, from 2008 into 2014, the researchers seeded storms that blew over both mountain ranges. During any particular storm, researchers seeded the clouds over one range, with the other range serving as the control. To be eligible for seeding, the storms had to bring mountaintop temperatures to lower than 17 degrees Fahrenheit (minus 8 degrees Celsius), and the clouds needed to have super-cooled liquid water. In less scientific terms, the storms had to be moist. Researchers had expected 60 to 70 storms each winter would meet these criteria. But far fewer that did, according to an executive summary of the report distributed Dec. 17 to the Wyoming Water Development Commission. Altogether, 118 storms were seeded and generated usable data. The results showed no significant increase in precipitation from storms that were seeded. 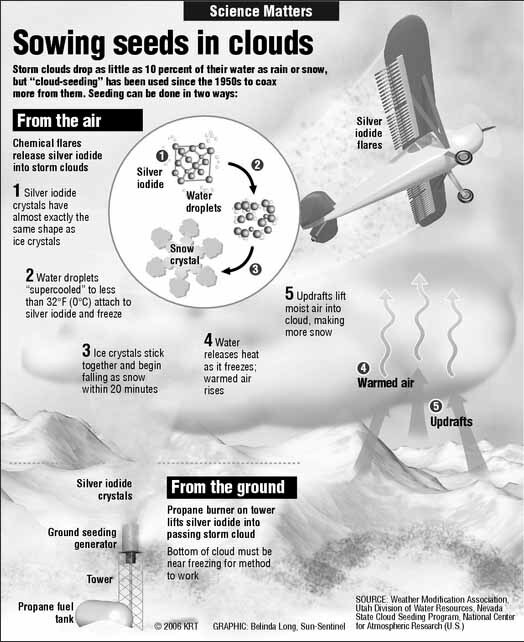 So, cloud seeding is a dud? The report said no. Lacking the desired number of storms needed for a better statistical analysis of precipitation, the researchers turned to measuring cloud seeding’s effect on variable infiltration capacity, which is a measure of snowmelt-driven streamflow. This modeling yielded a more optimistic takeaway of a 5- to 15-percent increase in precipitation, the researchers reported at the conference of the Colorado River Water Users Association on Dec. 18 in Las Vegas. But the real bottom line is that this is cheap water. NCAR estimated it would cost $35 to $107 per acre-feet of water in the North Platte River Basin if a 10 percent seeding effect affected 60 percent of the basin. Water in the basin has been marketed on a temporary basis for $30 and $75 per acre-foot. At the headwaters of the Colorado River, near Vail and Breckenridge, water is valued at up to $40,000 per acre-foot. In water, as in real estate, location matters entirely. The results seem to have changed few minds. In listening to the findings, cloud-seeding supporters heard evidence that the method works, and those who were skeptical before remained skeptical. “It confirms what we already thought,” said Thomas Ryan, of the Metropolitan Water District of Southern California, a consortium that delivers drinking water to 19 million people. Cloud seeding is just one tool for getting more water to a population, but an inexpensive one, he said. Others also cited that low cost. Tom Buschatzke, assistant director for Arizona’s Water Planning Division, said Wyoming’s study may justify cloud seeding in the Gila River drainage in Arizona and New Mexico. But Brad Udall, from the Colorado Water Institute, said he was unimpressed. “It’s in the modeling that they get these higher numbers of 10 to 15 percent,” he said. “These statistics still aren’t very good.” Like the other observers, though, he conceded that cloud seeding is a low-risk venture, producing inexpensive water if it has even a small effect. But he said the technique was unlikely to make much difference except on the margins. Yet to be seen is whether the federal government jumps back into weather modification. The government funded a great deal of weather modification research and operations beginning in the 1950s, peaking in 1972 before budgets were slashed, a slide that continued into the 1980s. In 2005, the Bureau of Reclamation issued a letter announcing no funding was forthcoming for weather modification. But the bureau conducted a meeting of Western water stakeholders in Denver this November to “get our arms around what constitutes good science at this point,” said Dan Raff, the bureau’s science advisor. 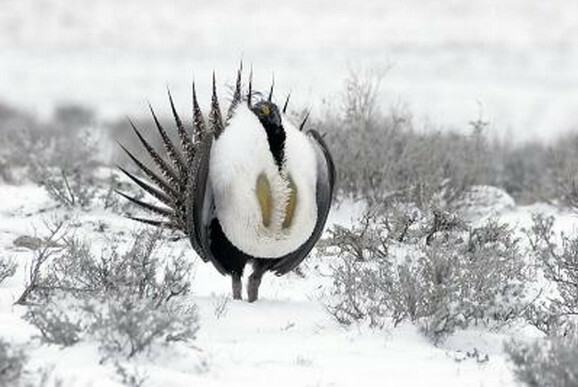 The meeting did not, he said, come in response to declining reservoirs on the Colorado River, but rather due to an “interest in having as much water supply as possible.” However, the agency did invest $200,000 in seeding clouds in the Wind River Range of Wyoming. To the extent the seeding succeeds, Las Vegas, Phoenix and Los Angeles will benefit. More cloud seeding coverage here. Climate: Warm, warmer … warmest? November temperatures across Planet Earth were well above average. FRISCO — Continuously high sea surface temperatures in 2014 are likely to drive Earth’s average temperature to a new record high, and also were a factor in heavy rainfall and floods in many countries and extreme drought, according to the World Meteorological Organization. The organization’s provisional statement on the Status of the Global Climate in 2014 indicated that the global average air temperature over land and sea surface for January to October was about 0.57 degrees Celsius (1.03 Fahrenheit) above the average for the 1961-1990 reference period.